These headphones ensuresuperb clarity with clear sound separation from deep bass to crisp trebles. Designed for maximum comfort and durability, these headphones have lightweight bindings on the headband and hanger to reduce the pressure on your head. The insulating material inside the headphones was also carefully selected and ear pads provide a tight seal, contributing to clear reproduction of mid to high sound ranges with subtle nuances. While known as DJ headphones, these headphones are also suitable for professional use in studios. The HDJ-2000MK2 professional monitoring headphones inherit all the best from their predecessor - the HDJ-2000 - and build on the legacy. These headphones don't only ensuresuperb clarity with clear sound separation, from deep bass to crisp trebles. 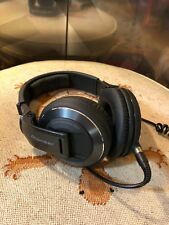 Pioneer DJ Headphone Black HDJ-2000MK2-K ... open box, but brand new, not used. This comes with box shown in photos, carrying case two cords (one straight, one coiled) and the 1/4 - 1/8 adapter to be used with either cord. Free Shipping. Pioneer HDJ-2000MK2 Flagship Professional DJ Headphones Black Finish . Brand new and unopened. Pioneer HDJ-2000-W White Professional Headphones !! Rare !! Rare Pioneer HDJ-2000-W - White Headphones, bought and never used . These are complete with original box in good condition, pouch, cable and manual. See pics. Shipped with USPS Priority Mail. Pioneer hdj 2000 headphones. Condition is Used. Shipped with USPS Priority Mail. PIONEER Headphones HDJ-2000 -MP. Headphones are in great working condition. Headphones have virtually no scratches on it, and the cushions appear to be in great condition. We have been open since July of 2013! This pair of Pioneer HDJ-2000 Headphones is previously owned and in good working condition. Magnesium set of headphones with excellent sound. What's Included?. What's included. DJ headphones designed for high performance and comfort. Designed for maximum comfort and durability, these headphones have lightweight bindings on the headband and hanger to reduce the pressure on your head. HDJ2000 And HDJ200MK2. You get a pair. Phi.3.5 mm stereo miniplug (gold-plated, 2way, threaded). Pioneer (Pioneer). Headphone plug, to improve the durability of the connection portion of the body and cable, has been achieved robust enough to withstand professional use. Brand new, unused, unboxed only for photos to be taken. Rare to find an unused pair of these iconic headphones as they have now been discontinued. In my opinion, these mark 1’s actually sound better than the current mark 2’s, which are too bass-heavy. These are the white version. Please note my 100% feedback score - I intend to maintain that! Postage within Australia is $10. International postage is $30. Cheers. This ear cushion is made of soft foam and artificial leather, which makes your wearing cozy and comfortable. With it, you can enjoy your stereo music to the fullest. Features: 100% brand new. Durable and soft, high elasticity. Material: artificial leather & foam. Easy to install and comfortable to wear. Idea replacement if you lost or broken your ear cushions. The ear foam will enhance the bass performance of your headphone. Pioneer hdj-2000 headphones, Serial number We are located in Japan. Item Title. Pioneer Headphone HDJ-C70 Black F/S from Japan. Sealed Dynamic Stereo Headphone. Asia, Middle East. Weight 298 g (without cord). Even if you think to yourself, "But the item I want is only available in Japan.". PIONEER HDJ2000 W Headphones for DJs. The professional high-quality headphones for DJs. After use, the Pioneer HDJ-2000 can be easily folded into itself. Closed, dynamic headphones. from Germany. Designed for maximum comfort and durability, this lightweight headphone features a special, adjustable headband that minimizes pressure on the head. Compatible with Pioneer HDJ-2000 HDJ-1000 HDJ-1500 Headphones, TECHNICS RP-DH1200 Headphone. This pair of ear cushions is made of soft foam and artificial leather, which makes your wearing cozy and comfortable. For Pioneer HDJ2000 HDJ1000. The ear foam will enhance the bass performance. High elasticity, durable and soft.